U.S. President Barack Obama welcomed the company’s plan to start construction on part of the controversial oil project, despite the fact that the rest of the route has yet to be approved. Alberta-based TransCanada Corporation announced plans today to begin work on the southern leg of the controversial Keystone XL pipeline, though the full extent of the proposed route has not yet been approved. The company maintains that the part of the route in question—running from Cushing, Oklahoma to the Gulf of Mexico—will serve well as a stand-alone pipeline to connect U.S. oil producers to refineries in Texas and the Gulf Coast. Now named “The Gulf Coast Project”, the southern section of pipeline is anticipated to be in service by mid to late 2013. "The Gulf Coast Project will transport growing supplies of U.S. crude oil to meet refinery demand in Texas," TransCanada CEO Russ Girling said in a release. "Gulf Coast refineries can then access lower cost domestic production and avoid paying a premium to foreign oil producers. This would reduce the United States' dependence on foreign crude and allow Americans to use more of the crude oil produced in their own country," he said. U.S. President Barack Obama responded to today’s announcement, welcoming the company’s plans. A statement from Obama’s press secretary said the project would help address the “bottleneck of oil” at a storage hub in Cushing, which has resulted from increases in domestic production. “Moving oil from the Midwest to the world-class, state-of-the-art refineries on the Gulf Coast will modernize our infrastructure, create jobs, and encourage American energy production,” said the statement. The move to start building in the south comes as TransCanada prepares to reapply for with a revised route for the complete Keystone XL project. The primary goal of the new application will be to avoid particularly sensitive areas in Nebraska—a major focal point for environmental critics. The company’s previous application to the U.S. Department of State was rejected because there was insufficient time for a proper review. But the White House has made it clear that the President’s decision to reject the original proposal does not prejudge future applications. 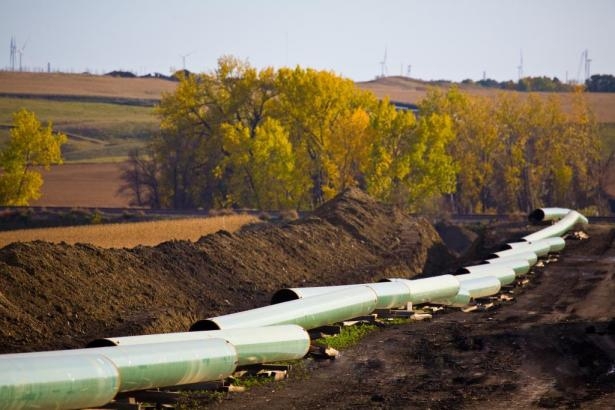 Susan Casey-Lefkowitz, Director of International Programs with the Natural Resources Defense Council (NRDC) wrote in a blog post that TransCanada’s decision to split the project in two is an attempt to “circumvent” essential approval processes. “This is a ploy to avoid a review that will show how the Keystone XL tar sands pipeline will raise U.S. oil prices, send tar sands overseas, endanger U.S. homes and waters, and contribute to worsening climate change,” said Casey-Lefkowitz.